Five-time Cup champion Jimmie Johnson was docked 25 driver points and crew chief Chad Knaus was suspended for six races on Wednesday by NASCAR after the No. 48 team failed inspection Feb. 17, the day before the Budweiser Shootout. After finishing 42nd in the Daytona 500, the 25-point loss sets Johnson 70 points behind the current points leader, Matt Kenseth. Johnson will likely need to finish inside the top-20 at Phoenix International Raceway this weekend, in order to get back to the zero mark. The infraction came after NASCAR deemed the ‘C-post’ on Johnson’s No. 48 Chevrolet was illegal. NASCAR said it was modified, which is not permitted according to the rule book. 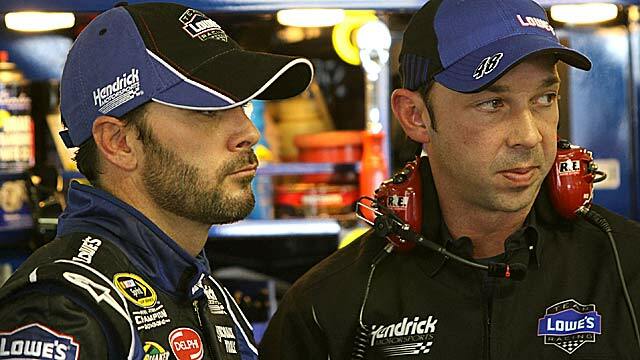 Hendrick Motorsports has announced they will appeal the penalty handed down from NASCAR. Knaus, meanwhile, has run afoul of NASCAR before. He’s been suspended four previous times, but had a two-race ban in 2005 overturned in the appeals process. His last suspension was for six weeks in 2007 when NASCAR said he had flared out the front bumpers of Johnson’s car at Sonoma. His first suspension was in 2001, as crew chief for Stacy Compton, because NASCAR said he had unapproved shoulder harnesses in the car. Knaus teamed with Johnson at Hendrick Motorsports at the end of that season, and the two have gone on to 54 victories and five championships. Johnson has a 55th victory, the 2006 Daytona 500, which was won while Knaus was serving a suspension. Darian Grubb filled in for that race. DAYTONA BEACH, Fla. (Feb. 29, 2012) – NASCAR has issued penalties, suspensions and fines to the No. 48 team in the NASCAR Sprint Cup Series, as a result of rules infractions found on Feb. 17 during opening day inspection for the Daytona 500. The No. 48 car was found to be in violation of Sections 12-1 (actions detrimental to stock car racing); 12-4J (any determination by NASCAR officials that race equipment used in the event does not conform to NASCAR rules detailed in Section 20 of the rule book or has not been approved by NASCAR prior to the event); and 20-2.1E (if in the judgment of NASCAR officials, any part or component of the car not previously approved by NASCAR that has been installed or modified to enhance aerodynamic performance will not be permitted – unapproved car body modifications). As a result, crew chief Chad Knaus and car chief Ron Malec have been suspended from the next six (6) NASCAR Sprint Cup Series championship events, suspended from NASCAR until April 18 and placed on NASCAR probation until May 9. Additionally, Knaus has been fined $100,000. Driver Jimmie Johnson and car owner Jeff Gordon have been penalized with the loss of 25 driver and 25 owner points, respectively.